What is AngularJS? 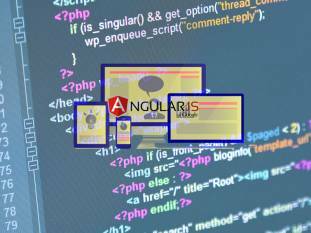 AngularJS, an open source web application framework, was originally developed in 2009. It was discovered by Misko Hevery and Adam Abrons. Currently it is maintained by Google. It provides developers to write client side application in a clean Model View Controller way. AngularJS is open source and completely free. It is used by thousands of developers around the world which is licensed under the Apache License version 2.0. So overall, it is a framework to build large scale and high performance web appliation framework and easy-to-maintain. It has the capability of creating Single Page Application in a very clean and maintainable way. It provides data binding capability to HTML so it gives user a rich and responsive experience. The code is unit testable. It uses dependency injection so it make use of separation of concerns. Write less code and get more functionality. Not Secure: Server side authentication and authorization is needed to keep an application safe and secure.